I do like New Zealand and every time I visit I praise and enjoy its extraordinary food culture. Not to mention the amazing scenery. There is so much fresh and flavoursome produce in shops, farmers markets and roadside stalls – ‘gate to the plate’, so as to speak. Kumera (Sweet Potato ) baked in local Waiheke honey and thyme. Restaurants and eateries where the owners or chefs grow or source their produce locally are not scarce. 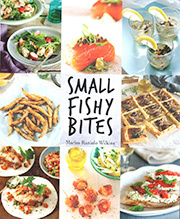 Fish too is local and staff in shops or in restaurants seem ready and eager to answer questions about their suppliers. …that is if the produce is not already labelled or written about in the menu i.e. line caught tuna supplied by a trusted small fishery. Menus highlight the production of New Zealand’s local and wide-ranging supply of produce and fine wines. We have friends on Waiheke Island so Auckland and Waiheke are always a must on each visit. On this occasion we were able to view the amazing sculptures on Waiheke Island (Headland Sculpture on the Gulf). Above, artist=Paora Toi-Te Rangiuaia. Who needs the Venice Biennale…they have their own! On this trip we hired a campervan and travelled to the Bay of Islands. Ever since my first trip to NZ I have been impressed by the apparent and increasing awareness and appreciation of organics and of locally-produced produce. Of course great and diverse produce is more apparent in places like Waiheke but as we travelled around we found satisfactory local produce in the 4Squre stores and in supermarkets….local sweetcorn or avocados were 5 for $5.00. Below New Zealand Spinach (also known as Warrigal Greens) growing on Waiheke in our friend’s garden. We even bought local fresh produce from the local garage, opportunity shop or news agent in country locations. On beaches around Opononi I found some samphire and some wild fennel near Rawene. We bought some local fish, picked some blackberries and I used all those ingredients that night for a meal. I picked some blackberries and we ate them with some fresh cream. Pity the prickly pears weren’t ripe! We could have pretended to be in Sicily! It is amazing how in limiting circumstances, how little one needs to make food flavourful and healthy. 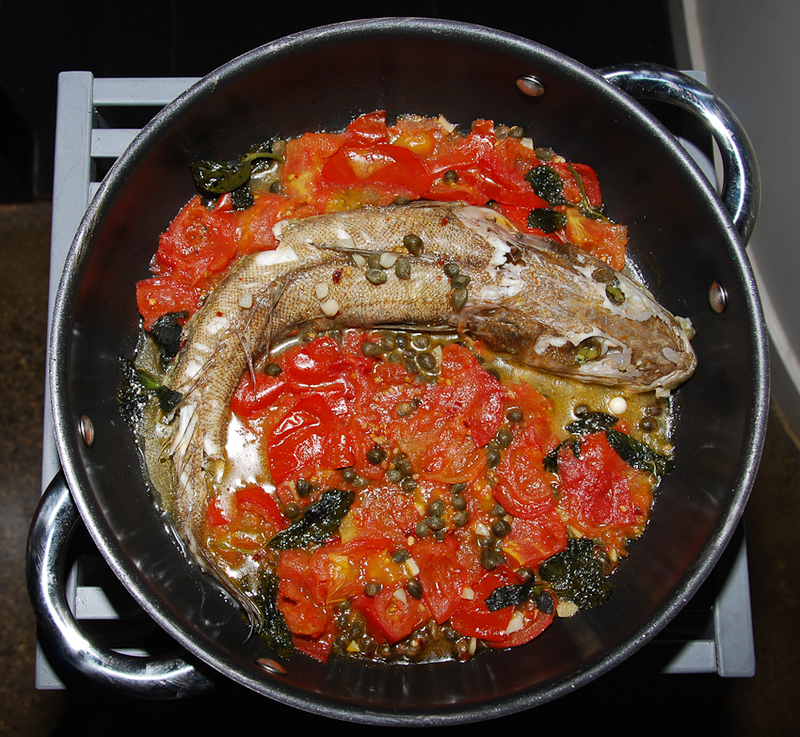 I cooked the above fish (very simply…what else can you do in a campervan! I pan fried in a light amount of extra virgin olive oil, fish turned once – it will only need about one minute on each side, add salt, pepper, a few herbs. Remove fish and then add about 3 tablespoons of red wine and evaporate. Return the fish to the pan, add a few more herbs if necessary. If I had some butter I may have whisked a little into the sauce. Below, simple lunch at the New Zealand Gallery… a bed of spinach leaves, cured meat, soya beans, raw beetroot, radishes, and a Japanese soy/sesame sauce. Light, fresh and simple. 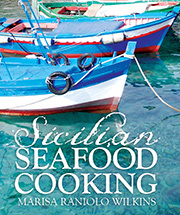 What I particularly like in Sicilian fish recipes is the use of whole fish. In Sicilian kitchens it is common to either fillet the fish before cooking it and use the bones to make the stock (for the accompanying sauce) or what is more common, the whole fish is cooked and filleted when ready to serve. Either way, the bones contribute to the flavour of the dish. In Australia so much of the fish sold is filleted, whereas in fish markets in Italy (includes Sicily) I have only seen whole fish – fish steaks from large fish, yes. Even in a pescheria (fish shop) there are very few fillets. In the past few months, in the fish market where I shop I have noticed larger than usual quantities of John Dory (called pesce San Pietro in Italian and pisci San Petru in Sicilian). A common Sicilian way to cook it is with marsala – fina or secca of course (both dry). I found a version of this recipe in my copy of Sicilia in Bocca, Harel Edizioni. 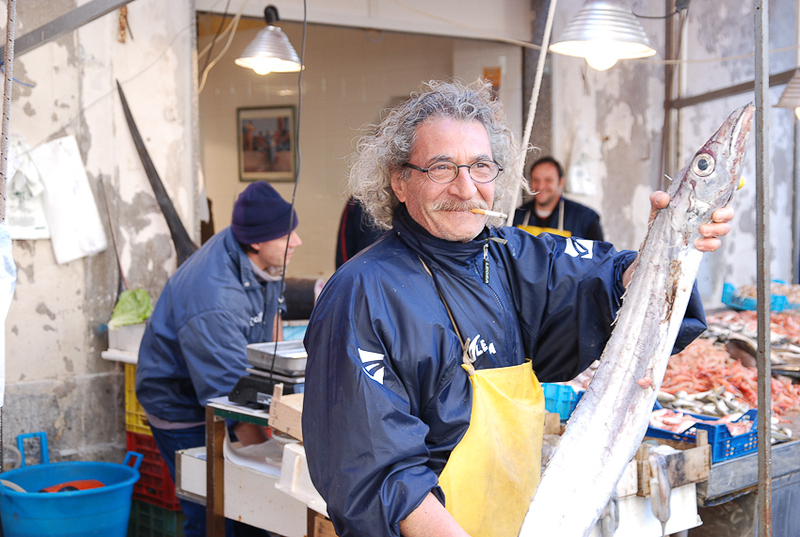 And why is it called Pesce San Pietro (Saint Peter’s fish)? The fish has a pair of dark spots on the sides of its large head that look like bruises left by two strong fingers. At some stage Saint Peter, the fisherman, caught one of these fishes in the Sea of Galilee, held it and threw it back. Peter obviously squeezed too hard on this occasion and in the following situations. Other stories are associated to a coin. It is a species of fish reputed to carry its young in its mouth and when there are no young it picks up, round pebbles or similar shapes. The fish that Saint Peter caught must have picked up a coin, the very one that Peter had to render unto Caesar, as directed by Jesus according to the Gospel of Saint Matthew. Yet another idealized Christian conception relates to Saint Peter throwing the fish back, renouncing being a fisherman and his possessions to follow Jesus and share the bigger riches of Heaven. Make fumet with head, bones, 2 bay leaves, 3 peppercorns,1-2 spring onions, a pinch of salt. Cover with water and reduce to ¾ cup. Drain and discard the solids. Dip each fillet lightly in flour and a little salt. Lightly fry on both sides in the hot oil. Add the marsala and evaporate it – leave the fillets without turning to prevent breakage. The marsala will caramelize. Add the fish stock and deglaze the juices. Add freshly ground pepper. I served it with a salad made with fennel and blood oranges (new to the season), and a little mashed potato to soak up the marsala flavoured juices.